Happy Valentine's Day, from Lovely! Sometimes I go to stores with Olivia and Eric so they can buy things for their apartment and I say "I am not going to spend any money!" And then I see themed gifts I can buy for my readers and suddenly my credit card is out of my wallet and Eric is saying "Oh, this goes with the set!" And then I smile at my awesome future brother in law and then I shoot him a dirty look for fueling my issues. My issues being I want to buy my readers things all the time. It fulfills my want to buy and my need to have no clutter. Win this great collection of Valentine's Day baking doo-dads. All you have to do is comment on this post saying what you'd like to bake with set, or for whom you'd like to bake, or what your Valentine's day plans are, by February 10 at 12 PM (NOON) EST. Comment as many times as you like, there is no maximum entry. What you see above and could win: 2 silicone spatulas, a set of measuring cups, a set of measuring spoons, 6 cookie cutters, a mixing bowl, colored sprinkles, an oven mitt and a pot holder. Well, my plan for this Valentine's Day is, really, as it is every year, to survive school (it falls on a school day, right?) otherwise, I'll just live it like any other day, for I am, as you might have guessed, forever alone. This stuff is adorable! I want! I would bake sugar cookies :) No V-day plans right now, other than judging a science fair during the day. Romantic, huh? a) You don't know it, but these are the exact colors of my kitchen. b) I would totally bake heart shaped sugar cookies with pink frosting. Because they are the BEST. c) How cute would a photo shoot be with these? OMG, how cute would a photo shoot be IN MY KITCHEN with these?! I'd love to win this so I could bake my mother a surprise. She deserves it. As far as I know, my Valentine's plans involve me watching Tron: Legacy with my best friends. Not a bad idea, mind you. Oh! And I should have said what I'd bake with the set! Silly me. I'm thinking of some classic sugar cookies. My mom/everyone loves them. I want to bake for all my friends!!! I'm thinking about a drop in baked goods "party". My husband and I experiment with reducing the sugar in recipes, so I'd love to make some reduced-sugar brownies and cut them into cute heart shapes! i dunno if it is for international. this is lovely color :) If i will win this stuff , i will give it to my friends daughter who love to play like she is a chef in their kitchen..
LOVE all of the pink and red. I'd make cookies for my boyfriend and dog biscuits for our bloodhound, Miss Daisy. I'm obsessed with baking, pink, red, and Valentine's Day, so this is right up my alley. Thanks for the giveaway! I would love it and treasure it and use it to bake tasty treats for my wonderful boyfriend! I may also nom some of the tasty treats myself! These may be the cutest things I've ever seen. I'm crossing my fingers big time!!! I would love this set, too cute. I would make sugar cookies for my son and his girlfriend! I'm a sugar cookie addict, too! The kids can't have them all!!! I hope to win !!! We actually don't celebrate Valentine's day, we have another love day called Dragobete on 24 febr, more info you can find here: http://en.wikipedia.org/wiki/Dragobete. Me and my husband love to prepare a romantic dinner, a good movie, a good wine and spend beautiful moments together. I would definitely bake and watch chick flicks all day! I'm always a sucker for some sappy romance :) i will also be spending the day with my dog! I'm hoping my husband and I can have a nice, quiet, romantic dinner for Valentine's Day! My kids and I love to bake together so we would definetly put good use to this cute set! my three year old would love the sprinkles. That's his favorite part of sugar cookies. Hey my name is Karina. I'm 21. I would love this baking set, i'd bake cookies, cupcakes and cakes for my mom, friends and other family members. I'm just getting into baking and this would be my first set to encourage me to do more & get better. With the sprinkles, I'll be able to decorate. For Valentine's Day, my best friend & I are each others valentine. I'm baking her a cake and making her chocolate covered strawberries and we'll probly relax and watch the twilight series. I hope I win this cute set. well if I win this I will have fun making and baking things with my daughter and her many cousins. It looks like such a fun set - good luck to all the entrants. And seeing as there's so much of everything, I'd probably give some of those tools to my mom! So she could bake some things for me :) Hope I win! This set is crying out for sugar cookies. Sadly I have no plans, but now I think I might bake the night away (even if I don't win the set). My Valentine's Day plans are staying home and baking red and pink cupcakes for myself! On the off chance that I do win the give-away, I'd throw some iced cookies into my plans! This set is the most adorable thing! I'd be making cookies with pink & purple icing. And I'm always making rainbow cupcakes, but for valentines day i plan to just make pink & red coloured ones! I don't have a 'special someone' though so I'll just be spending the day with my pets & family. I'm a lonely bunny, so I'd either bake myself a "congrats on acing your theatre school audition" cake or "sorry you bombed your theatre school audition" cupcakes. Both very necessary, and if I do in fact go away to school, I'll need my own kitchen set, won't I! if i win this i would love baking things for my family (maybe get my younger sister interested in baking/cooking). Also, this would be such a treat to add to our kitchen since my mom has never really paid any interesting into baking or cooking so baking supplies are always quite lacking. It would also be fun baking with my friends when we hangout. Also, maybe baking some cute treats for someone special on valentines day after school. awww i just came across this via tumblr. if i won this i would bake jam filled alfajores! yum! If I won this, I would use it to bake my husband his favorite, peanut butter cookies. If I win this set, I would bake red velvet cupcakes with creme cheese frosting and decorated sugar cookies for my boyfriend all from scratch... maybe something with peanut butter too because that's his favorite. We are unable to come together for Valentine's day because of our busy schedules, so I would send these baked goods his way as a gesture of my love. I think I will do this whether or not I win this set. Thanks for the awesome giveaway! I'd make Valentine's Day sugar cookies! I don't have a Valentine (not that I'm upset by this), so I'd probably share them with my friends! Oh, and of course my mom. I would bake for my family and friends! And definitely sugar cookies! I would bake the obvious Valentine’s Day cookies, but with naughty suggestions written in sprinkles. Then I would drive them out to my husband at work so I could see him for Valentine’s day, otherwise I will bake cookies for my dogs to share so they can feel the love of Valentine’s Day. This collection is so freaking cute!! Can you feel the love? With this set, I'd like to bake some brownies, cookies, and something new with my little sister for my friends, family, and others who want a treat or anything. It'd be fun to bake with some friends. My hubby and I are newly weds and this lovely little set would be perfect for our Valentine's Day! He's finishing up his Master's degree right now so we have to be very creative with our date nights. He loves spending time in the kitchen (and his fave color = purple because that's the color of The University of Scranton, where we met:). I could see us finally trying to make homemade truffles and from-scratch sugar cookies with all these goodies! Lots of good vibes to you and thank you for being so sweet to your readers! Ahhh! I'm so glad I came across this from the thingsorganizedneatly tumblr! I was just thinking that I'd love to have a bunch of cute V-Day cookie cutters :] And sprinkles! Unfortunately, my midterms week begins on V-Day :[ But I'm planning on taking a study break to make bakerella's red velvet cake balls. BUT IN HEART-SHAPED BALLS! Covered in pink-dyed white chocolate! And I'm going to buy the Disney Princesses kiddy valentine cards, so I can give my friends cute gifts before midterms! Thanks for the great giveaway! And with that, I'll end this essay. Thank you tumblr for introducing this cute blog! I would like to make with this set some heart shaped pancakes. I don't know how but I think I might figure it out... And I will make them for myself and my family, and perhaps my ceramics studio because I love them all like a second family. I would love to make vanilla shortbread cookie sandwiches, double stuffed with peppermint icing for all my lovely valentines (six hungry college-age male roommates)! This is an adorable set! My little brother is my best friend in the entire world, we are inseparable. I rarely see him since I'm away at college. But, this weekend I'm going home to visit and we plan on making Valentines cupcakes. Seeing this reminds me of our baking adventures together. Too cute! I would bake my parents and grandpa and brothers some cookies...just to say I love you. 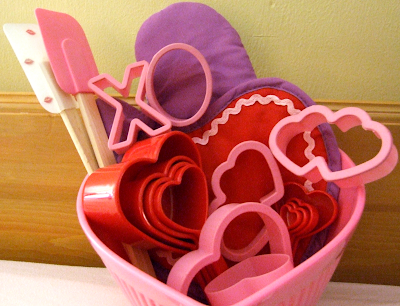 I'm planning on making french onion soup for my boyfriend for Valentine's day, so i'd use the heart shaped cookie cutter to cut out some bread for the bottom of the soup bowl. I was planning on getting up in the middle of the night to make a nice Valentine's table for my whole family to wake up to. They all wake up for work and school really early, so it would be a nice morning surprise! OH, also ... my boyfriend of almost three years is a pre-med college student. In between saving money for medical school and being to stressed out/busy to actual make food he doesn't always have the best meals. I would make him and his roommates something yummy to cheer them up when midterms are here. My 13 year old sister dreams of being a pastry chef. We like to cook together, it's sort of a bonding experience. She's much better in the kitchen than I am...and I'm college bound. Since I'm single I'll probably spend Valentine's Day with her anyway, so this would be a neat activity for us. We really need a mixing bowl too. i'm so glad i came across this link through tumblr. 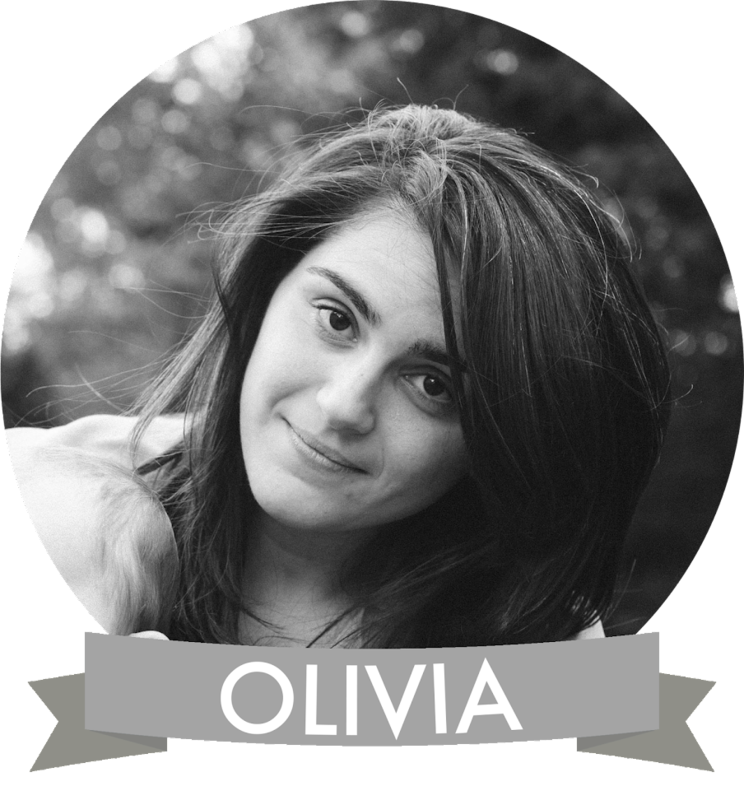 i adore your blog. i love baking, i plan to continue on with it once i get my design degree. If I won this, I would make my very favorite sugar cookie recipe (I love occasions to make it since I don't really care for everyone else's favorite chocolate chip cookies). I would decorate them with red hots, carefully pack them and send them to my mom with a note telling her how much I love her and thanking her for teaching me how to bake. I love to bake, but I love sharing my creations even more! But... my best friend in the entire world LOVES to bake and she wants to grow up to own a bakery. She makes baked goods for everybody's birthdays and holiday (a turkey shaped cake for halloween) and this would be a wonderful collection to gift. And I'm sure her wonderful gift would be shared through baking with everybody in her vicinity. I love her to death and this would be an amazing Valentines day gift. My roommates demand cookies, and I love to oblige! Who needs a special day to show love, though? I'd probably use these all year round. My cookie cutter collection is somewhat lacking. I'd bake for my baby, of course. She's three, and quite the little cookie whiz. I would bake for my boyfriend Nick! Chocolate heart shaped cake! Apparently I'm making banana bread tomorrow, but I guess I won't have a cute heart shaped mixing bowl to mix it in! Hmm. I wonder if you could make banana bread heart shapes... obviously a lot thinner than real bread. More like banana bread bars. Mmm. On Valentines with this set, I'd bake cookies for my family in remembrance of my grandma. No matter how much we fought, I always loved her. At the end of October 2010, my grandma was diagnosed with aggressive leukemia; she was so frail and old that any sort of treatment like chemo was not an option. She was given a minimum of 3 weeks to live, and a max of 6 months -- she lived on for 4 weeks following her diagnosis. The morning she passed away my dad was with her; he sang one of the hymns she loved, and just as he finished the song, she took her last breath. I miss her so much, my whole family does. When she was still mobile, every Valentines Day she would buy roses for my mom and something nice for me. My grandma was always a very generous person, no matter how deserving or not people were sometimes. I feel baking something with a set like this on Valentines Day would be a nice way to commemorate her on a day that she always gave to others. Moreover, it's a way to show appreciation to my parents of how thankful I am of them and how their strength has kept my brother and I strong as well. Okay. I know you said unlimited entries but I still feel bad posting more than one. ... But I'm going to. Because I really, REALLY want those cookie cutters. And the oven mitt. Well, everything, honestly, but especially those things. Anyways, I also just thought of another thing I could use this for. Next week is Janitor Appreciation week in my dorm room, and me and a hall mate are making chocolate chip cookies for our Janitors. I think heart shaped chocolate chip cookies would probably be super awesome. I'm spending the day with an activist friend, planting valentines around London reminding people to love the Earth & each other. if i won this, i want to bake for my friends. they have been giving out cookies and cupcakes to everyone randomly for the past year and every time i eat it i feel really bad. and i'm finally getting oven this weekend (at least my mom promised she would) and i really really really want to bake for them. I'm halfway across the globe and I don't know if I'm eligible to participate. If i won this, I know it will feed my addiction for baking and my sweet tooth will be happy. i would to like get this baking set for myself.i have never try baking before and would like to make chocolate cookies for this valentine.i'm single but i hope my chocolate cookies will be a great valentine's gifts for my parents :). I'm celebrating the V Day with my best friends and I will bake for them so that we can remember that we don't need BOYS when we have COOKIES. I would bake owl themed cookies for my boyfriends two housemates, to convince (bribe) them in letting me live with them all! then we could all make cookies together! I love that heart shaped bowl. And all things hearts and pink and red (except jewelry...). I keep Valentine's things out long past the holiday because they always seem so cheerful. I would definitely bake up some chocolate shortbreads for my boo and visitors. Valentine's day is my birthday! It's going to be tough this year because my boyfriend is 800 miles away (at school) and so I'll be alone on the actual day. He's going to come visit the weekend after, and I would love to have our own Valentine's day together - we both love to bake, so spending time in the kitchen together would make it that much more special. We haven't seen each other in months, and we'll only have a few days. It would be great to spend some time baking heart shaped cookies or cutting out little heart shaped brownies and making brownie pops that we can dip in melted milk chocolate after we have a nice dinner together. I'm also a big fan of handing out treats to everyone I see on Valentine's day, because so many people are bummed out if they don't have someone to celebrate with! It's kind of tough having a birthday one Valentine's day (I always say people are either busy, or miserable :p) so I try and give a little sweetness to everyone. Heart cookies and brownie pops would be a great way to make my friends and family smile. I would definitely bake berry filled tarts and cut the top layer of pastry crust out of the cookie cutters to make a little layered heart top. I'd probably be baking for my roommate, or as we've been calling each other lately, my room date. Then I would make a cake. Also, I just moved and some how my box of kitchen things really got a little banged up. I need to replace plain measuring cups I bought that cracked, I really think this is perfect. And the little silicone cookie cutters, my heart is definitely aflutter. i would love this! i'd make cookies to send to my boyfriend. we go to school across the country so we can't spend valentine's day together, but this would make it much better! I just got a new sugar cookie recipe I've been DYING to try! My husband has a sweet tooth and this would be the perfect Valentine's treat for him! This stuff is so cute!! I would LOVE to win this! I think my boyfriend needs some sugar cookies for V-tines Day. He lives 500 miles away and the 14th marks a year and eight months that we've been together, but we won't get to see each other this year because we're both so busy with school. <3 I've spent weeks searching for the perfect gift, but I'm a little short on money this year (I'm saving EVERYTHING I earn so I can transfer to his school and move so we can be closer together) I think some beautifully decorated cookies would be perfect to add to his package. He always loves when I send him baked goodies! i'd like to make my son all three meals using valentine shapes, starting with heart pancakes and ending with XOXO dessert! This is the first Valentine's day in 3 years that I'll be with my boyfriend, as we're finally living together! Money is tight so we're doing a very low-key date, but I think we may splurge on dinner out. I would really like to make some snickerdoodles with this set and bring them into the office, because sometimes Valentine's Day at work is just too depressing! I'd also bake some treats for the package I'm sending to my parents for Valentine's day--key lime bars for my dad and some kind of fancy cookie for my mom! It's the least I could do for the 23+ years they've raised me. Sugar cookies for my husband and co-workers! I'm on a bit of a baking adventure (aka attempting to bake things I've never tried before). Last week's challenge was cream puffs. I would love to tackle macarons next and I just know they'll come out perfectly and be extra adorable if I used this set. I'll be spending St. Valentine's day with my grandmother! 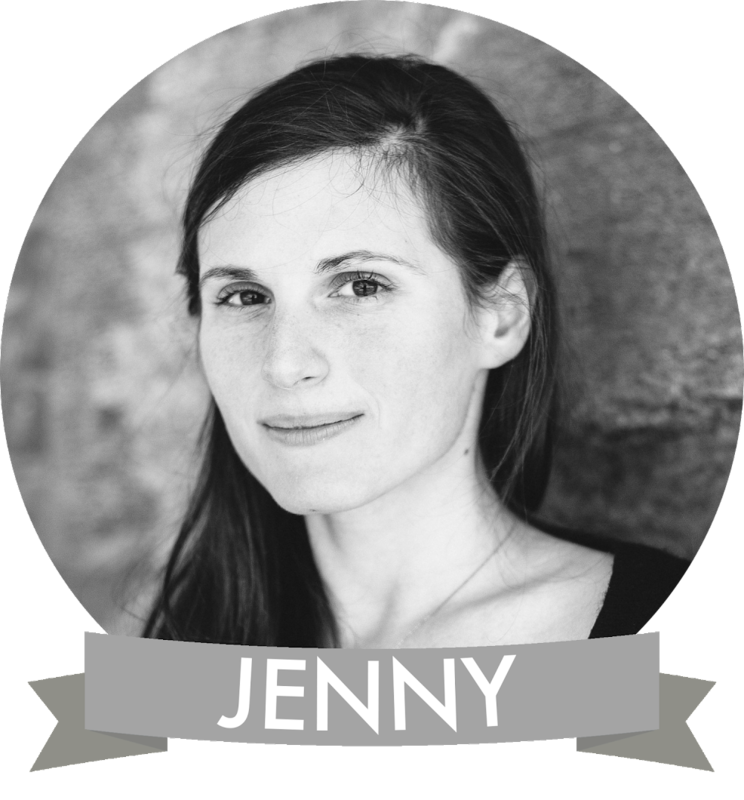 I love hearing her romantic stories from when she was my age, meeting my grandfather and such. It would be even more wonderful to share these stories over some lovely home-baked treats! i would bake a boatload of chocolate chip cookies, wrap them up into pretty little packages and give them to my friends (because they're awesome). i'd save an extra batch for me and my man to make valen-times ice cream sandwiches though- WHAT UP! I work at a group home for psychiatrically disabled veterans, and on Valentine's day (which is also my two year anniversary) I have to work two shifts so I don't have any lovey plans. If I had this set, I would make adorable cookies for the residents! Actually, I'd probably make heart-shaped cookies year round, whenever they needed a little extra happiness. I love this little set. I think I would bake cookies for the whole family. Sugar cookies with fluffy buttercream icing! Even if I don't win, I think I'll make those anyway. i would bake my signature triple chocolate brownies that my fabulous boyfriend loves so much. I would love to bake for my friends here in college! This set is adorable! I'd love to use it to whip up some cookies and cupcakes with my little! My favourite little piece and I would share the cooking duties for once [she'd probably make the savoury] whilst I'd make some amazingly shaped red velvet whoopie pies. I would like to bake a batch of Smitten Kitchen's Irish car bomb cupcakes for all of my friends, as an anti-traditional Valentine's Day treat. I would absolutely love this collection of goodies, also, as I am an aspiring baker working with a small college kitchen and limited resources. Thank you very much for the consideration! I would get a cupcake cookbook and start baking all kinds of cupcakes for my fiance (he proposed last Friday!) to see which flavors he would like to use for our wedding, which will be a dessert table all made by us, our friends, and family. To be honest, I love cooking and baking and everything of the like. My friends and I often refer to Valentine's Day as "Singles' Awareness Day", because sometimes that's what it feels like. So I would honestly make goodies and give them along with other little gifts away to all my friends so that they know that even if they don't have a significant other on this holiday, they are still loved, and they can at least celebrate that. This set is completely lovely. With it, I would spend the day baking with my niece! She would love it as much as I would! If I didn't bake with my niece, I would make goodies for all of my friends here at university, many of whom are far from family and loved ones. I would love to make cookies for the girls at the boutique I work at. They would love them so much! aw this is such a sweet mix of baking goods! I don't have Valentine's plans per se, but on the 11th, I'm helping my school throw a "Valentine's Day Open Mic/Band night" which will hopefully turn out well! I was invited to a "loveluck" on the eve of Valentine's Day which is a potluck where everyone brings foods and instruments (preferably aphrodisiacs) but I'm not sure if I'll go yet! i would keep the set and bake cookies for/with my lovely single lady friends. we're not planning on having a get-together for hating on the holiday, but this would certainly be the perfect catalyst to have a little party. I would bake for my little 2-year old nephew who is just discovering the joys of mixing and stirring! I would probably also bake something delicious (like sugar cookies or raspberry chocolate chip cookies) for my boyfriend. Ohhh or cupcakes for my co-workers on Monday! I'd like to bake two cakes in the shapes of bunnies and little heart cookies to surround them! If I won this set, I would make Valentine's Day cupcakes for all of my friends...and myself because I love cupcakes. Linzer cookies featuring raspberry preserves and nutella MMM! Awww, those measuring spoons are the bomb. Makes my heart jump a little extra. We are heading to Long Beach, WA for our annual Valentine long weekend getaway. I would love to bake the chocolate cookies on Joy the Baker's site I saw today and share them with my family (and boyfriend). Yum! Thanks for the opportunity. I'd love to bake some gluten free cookies using this beautiful set! It'd have to be for myself, though, since I won't be seeing my lovely boyfriend this Valentine's day (he's outta town). So adorable! I think i saw these at target? i love their valentines day collection :) and if i won these i would definitely add to my small collection of baking supplies and try to get my baking groove back. i was really sad to throw away all my expired goods :( stopped baking like crazy for school. i want to reignite my love for sweeets!! I'll probably start with cupcakes, so i can try to make something out of the book "What's up cupcake?" that i want to buy. or maybe cookies! i would bake for my boyfriend because he misses my baking days too. gahhh i feel like i lost myself. anyways, i don't know what we are doing for v-day but im hoping i get to spend it in a tent made with blankets, a glass of milk, cookies, and a movie with him. I would love to bake with my daughters with this!! 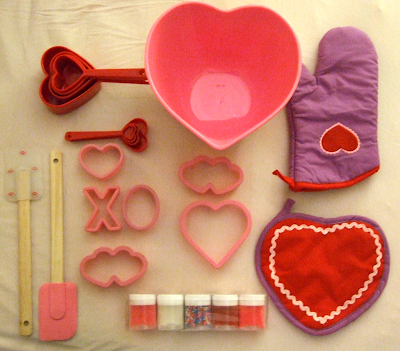 There's no Valentine's Day decorations that can beat this baking set - everything included is so cute, and completely not nauseating! If I won this set, I would definitely bake for myself. As sappy as it sounds, a Valentine's Day spent alone can be just as celebratory as one spent with someone else. It'll be a rare moment where I reflect on what I love about myself! And this includes my body, which is why I wouldn't mind indulging in a few sweet treats that I baked with my new heart-shaped baking tools! I would actually bake for my friends with this set. Only one of my best friends has a boy and the other 5 have always been single for Valentines. I love them all like sisters and rather than getting them flowers or typical chocolates home cooking is such a better gift for all occasions. Rather than being anti-valentines this year I can embrace it by making my friends happy while doing what I love. I LOVE ALL OF THIS STUFF!! Ah!! For Valentines day I'm going to make some brownies because I'm pretty sure they're the best...ever... I don't have any plans because I have nine hours of class on Mondays so I'll be sitting in school learning all day instead of feeling the love. I'd bake for my daugher and her daddy!